With plenty of moving services, Meathead Movers is fully prepared to make Manhattan Beach Movers your new home. Our clean-cut student athlete movers are dedicated to fulfilling all your moving needs efficiently. When it comes to high-end coastal living, there is no town that compares to Manhattan Beach. With so much to offer, moving to this upscale beachside town is an appealing decision. However, to ensure that the transition is free from hassles, it is critical to trust the best Manhattan Beach movers. Located in southern California, not far from Los Angeles, Manhattan Beach has picturesque beaches and affluent living options. Its coveted location has made it a popular draw for many celebrities. In the years since its founding in 1863, the area has thrived dramatically and is now home to some of the most impressive properties along the west coast. One of the most popular locations in the city is Rosecrans Strip, which features high end shopping and Manhattan Village Mall. On the nearby Aviation Strip, people can visit Manhattan Beach Film Studios. The city also has ample opportunities for outdoor recreation, including The Strand, which is popular for biking, jogging, and more. Of course, there is always the beach itself which is ideal for swimming, surfing, and other water fun. Life in Manhattan Beach is often nothing short of picturesque, however moving is rarely that enjoyable. To minimize moving stresses, it’s important to choose Meathead Movers to get the job done right. Our Manhattan Beach movers are well equipped to handle any moving job, including packing, storage, local moves, and long-distance moves. Our staff can organize on-site relocations and commercial moving projects. We also carry a full range of moving supplies to ensure any job can get done right. These services are hard to beat but Meathead Movers is always sure to go the extra mile. In order to provide the best service, we recruit clean-cut, drug-free, respectable student athletes known for their endurance and commitment to excellence. Each employee is expected to complete training at Meathead University. On top of all that, we expect all of our Manhattan Beach movers to jog while not carrying items to ensure that no time is wasted. 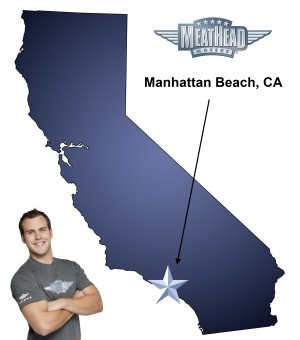 Clearly, when it comes to Manhattan Beach movers, Meathead Movers is unparalleled. We are also the only moving company in California to offer a 100% satisfaction guarantee. Contact us for a free quote today to see how we can help organize your next move. Moving to Manhattan Beach? Here are some helpful resources. View more Manhattan Beach resources. The two guys that showed up were very nice, but they quit after 2 hrs. They bragged they would be done by 1pm. I stopped them at 1:45pm to finish the move myself. They damaged my king bed headboard. They didn’t know how to pack the Pod and my wife also noticed they quit working. A full refund would be a clean way to end this horrible moving day. Your service didn’t meet the hype. I will be calling tomorrow. Thank you. Your company always does a good job. That is why we have hired you multiple times. what a mess! never again! I called management after the movers left to express the issues. The basic issues were: The movers had an 10:00 am arrival time. The movers asked to see everything that was to be moved, They started close to 10:20 to actually move anything. They moved several large objects (bookeshelves and a workbench) but no boxes. They didn’t even move the shelves with the bookshelves, They said the truck was at capacity but nothing was stacked on anything, The contents were one level high. I arranged for a street side storage unit for ease of moving. They were able to unload in less than 10 minutes which was faster than I was able to fill out the storage paperwork. They stayed around 1/2 hour more saying their boss was busy and they were waiting to process the payment. They misstated the actual time worked on the checkout sheet. I was required to secure a four hour minimum. They barely worked over an hour. To make things right I am requesting a 50% refund. Thanks. Easy to schedule, fast, professional.